Fujitsu Limited, Fujitsu Laboratories Ltd., and the Kitasato Institute's Kitasato University Oriental Medicine Research Center (below, Oriental Medicine Research Center) today announced that they have collaborated in the development of a new glove-type touch sensor that captures touch data when a Kampo(1) doctor palpates a patient. Kampo doctors frequently use palpation to understand the body's condition and signs of illnesses. Because this process is based on the doctor's own knowledge and experience, it has been difficult to produce data on the process that would help other doctors objectively understand the basis for a diagnosis. 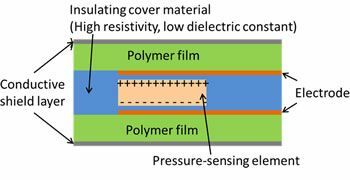 In this newly developed technology, a flexible, thin-film pressure sensor has been made that does not cause any loss of sensitivity when used in an examination. Sensors are fitted to the finger pads and measure sensory information as pressure data when the doctor touches the patient during a palpation. Tying this to the track that the doctor’s hands follow quantifies the touches so that they can be recorded as data. This will make it possible to amass data on palpations by Kampo doctors and look at them objectively to help doctors with future diagnoses, and will contribute to the discovery of sub-health(2) . Part of this project was developed under Japan's Ministry of Education, Culture, Sports, Science, and Technology's The Center of Innovation (COI) Program (COI Stream), promoted by the Japan Science and Technology Agency, under the program title "Research and Development on Mibyou Control System Using Safe and High Quality Kampo Medicine and Information and Communication Technology." This development is being presented at the IEEE.International Conference on Sensing Technology 2015 (ICST 2015), which opened December 8 in Auckland, New Zealand. An important aspect of Kampo is to promote a long, healthy life in which everyday activities are not restricted by discovering conditions that may lead to illness before they actually manifest as illness, and deal with them at that level. Kampo doctors can detect sub-health conditions - that would not be diagnosed as illnesses in Western medicine - before symptoms appear. But the diagnostic standards in Kampo - which are based on interviews, taking pulses, examining tongues, and palpating the abdomen - often rely on the practitioner's subjective impressions, and have never been defined. In Kampo, palpation in which the patient's abdomen is directly touched, is an important technique for judging the patient's condition and signs of disease, but as the final analysis is based on the practitioner's experience and knowledge, there needs to be a way to formalize diagnostic standards and express them objectively in order to pass that information along and cultivate the skills of other doctors. Objectively capturing a doctor's palpations as data using ICT would require a sensitive, flexible sensor that made neither the doctor nor patient feel uncomfortable, an important feature considered during development. Fujitsu Limited, Fujitsu Laboratories, and the Oriental Medicine Research Center together have developed a prototype of a system that can detect where the body is being palpated and can capture firmness data using a glove-type touch sensor that does not diminish the doctor's sense of touch when palpating (Figure 2). Features of the technology are as follows. The pressure-sensing element is based on an induction film (electret), which has the property of separating positive and negative electric charges without an electrical field; taking advantage of a characteristic of these in which their internal electrical load changes when pressure is applied. Using this property, the partners developed a highly sensitive pressure sensor (Figure 3). A high-resistance film surrounds the pressure-sensing element to minimize charge leakage, and the voltage response continues from the moment that pressure is applied. An insulating material with a low dielectric constant minimizes the electrical capacity of the pressure-sensing element, which increases the voltage output in proportion to the applied pressure, resulting in better sensitivity. To capture sensory input when a doctor is palpating a patient without diminishing the doctor's sense of touch, the partners developed a thinner membrane using polymer film(3) , producing a membrane with a thickness of 100 to 300-micrometers with improved flexibility. These improvements obviate the need for a driver power source in the pressure-sensing elements that contact the patient, resulting in good sensitivity and improved safety. The partners built a system that tracks the movement of the doctor's hand with an accuracy of approximately 0.2-mm, using reflective markers attached to the fingertips of the glove and an infrared camera that monitors those markers. The system captures hand positions every 10-milliseconds and combines that data with the data from the pressure sensors to accurately synchronize and record pressure and palpation location. The prototype touch-data collection system was used to capture touch-data in a mock examination experiment at the Oriental Medicine Research Center (Figure 4). 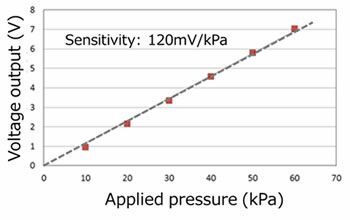 This shows linear responsiveness to applied pressure, producing 120-mV per 1-kPa of pressure on average. This corresponds to an output of 120-mV when applying 1-gram of force over a sensing surface area of 1-mm2. The prototype circuit produced approximately 10-mV of noise continuously, but because the signal from hand pressure is more than 10 times greater, this was found to permit sufficient responsiveness to minor changes in palpation pressure. This was confirmed to capture numerical data from the sensor with no significant difference from the actual palpation. Fujitsu Limited, Fujitsu Laboratories, and the Oriental Medicine Research Center are considering ways to further improve sensor sensitivity and to expand sensor coverage to the palm of the hand, and look forward to assisting doctors with their palpations while amassing data from palpations by Kampo practitioners using this technology to make it objectively assessable. One type of traditional Japanese medicine that is based on and shares many similarities with traditional Chinese medicine. A term used in connection with Kampo to describe a borderline state between health and disease. A membrane used to protect and insulate electrodes.